We are listed among the most sought after names in the industry for providing Wheel Flow Indicators. We are renowned Manufacturer, Exporter and Supplier of Wheel Flow Indicators; manufactured using high grade and excellent raw material. The fabrication process commences under the supervision of engineers. The offered Wheel Type Flow Indicators are precisely provided with two nos of circular, round toughened glasses and a rotary wheel as a indicator. 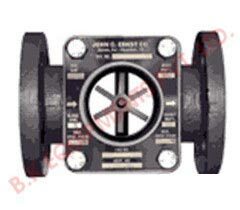 Specifically designed and developed by experts for the gas pipelines, colorless process applications and power plants; the Wheel Flow Indicators are best suitable to see the flows and levels for both in the vertical and horizontal pipelines and vessels. We also offer non-metallic sight glasses.